Have Trouble Finding Your Exam On Train4sure? Need preparation materials for an exam we don't have on the website? Request it here, and we will notify you the moment the exam is available. Simply enter the code of the exam you want, plus your email address. We will get in touch with you as soon as we add this exam to our website. Need your exam NOW and cannot wait? We understand! 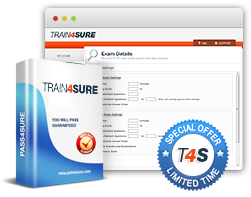 As an urgent solution, you can preorder your exam from Train4sure. We guarantee that your Questions & Answers will be delivered to you within 4 weeks. Follow the instructions to complete the payment. We will arrange real Exam Questions within 4 weeks especially for you. You will be notified once exam is available for download in your member area (in the Testing Engine format). Refund policy applies - please contact us for details. READY TO MAKE YOUR PRE-ORDER? Proceed to Next STEP and Make Your Payment.